Puyi as Emperor of Manchukuo. 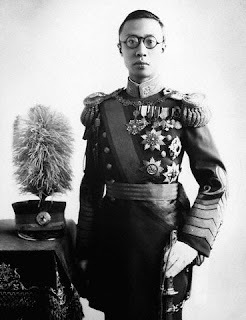 Puyi (Wade-Giles: Pu-i; 7 February 1906 – 17 October 1967), of the Manchu Aisin Gioro clan, was the last Emperor of China, and the twelfth and final ruler of the Qing Dynasty. He ruled as the Xuantong Emperor (Wade-Giles: Hsüan-tung Emperor) from 1908 until his abdication on 12 February 1912. From 1 to 12 July 1917 he was briefly restored to the throne as a nominal emperor by the warlord Zhang Xun. In 1934 he was declared the Kangde Emperor (Wade-Giles: Kang-te Emperor) of the puppet state of Manchukuo by the Empire of Japan, and he ruled until the end of the Second Sino-Japanese War in 1945. After the People's Republic of China was established in 1949, Puyi was a member of the Chinese People's Political Consultative Conference from 1964 until his death in 1967. Puyi's abdication in 1912 marked the end of millennia of dynastic rule in China and thus he is known throughout the world by the sobriquet "The Last Emperor" of China.